Rene refused to reveal her formula to any authorities during her lifetime. This fueled horrendous political fights as the medical authorities tried everything to obtain the miraculous formula. Her life was a constant battle for advancing people's quality of life. Dr. Gary Glum recorded her tumultuous experience in the book The Calling of an Angel. His declared position is: I believe that information should be in the hands of the public. People should have the right to make their own decisions about whether or not they will drink the Essiac tea (Ojibwa tea today). My goal in this book is simple: I want to tell the story of this ordinary woman's extraordinary life and share the knowledge of Essiac (Ojibwa) so that people can make their own informed decisions about what their future should be. I don't pretend to have all the answers about how and why Essiac works. My book documents countless accounts of miraculous results during Caisse's life. We encourage you to read the whole book. This is a brief summary on Rene Caisse's life story as presented in The Calling of an Angel. The quotes are excerpts from the book. The herbal "Ojibwa" tea we provide, is prepared according to Rene Caisse's original formula. Always, in all cultures, there was what might be called living proof medicinal value of plants long before there was scientific proof and acceptance. Living proof, of course, is not acceptable to the scientific community. Not even the testimony of ordinary individuals, sworn to oath, meets the rigorous standards of scientific proof. But no matter what happens in the scientific world, living proof will be what passes from person to person and prevents Essiac from dying out altogether in the modern world. Rene Caisse learned her formula for her miraculous plant tea from an old Native American healer. In 1977, the editors of Homemaker's, a nationally distributed Canadian magazine based in Toronto, heard an awesome story: An 88-year-old nurse from Bracebridge had been successfully treating terminally ill cancer patients for 50 years with her secret herbal formula. Rene maintained was that Essiac caused regression in some cancerous tumors, the total destruction of others, prolonged life in most cases and - in virtually every case - significantly diminished the pain and suffering of cancer patients. The results were astonishing. She described diminished results in cases when patients had received radiation. Also, Essiac has been proven ineffective when the organs have been destroyed: No, I did not say that. If the organs are destroyed, yes. I cannot build new bodies. Her patients swore by her. They were devoted. Men and women who believed she cured them of cancer told their friends and families, wrote letters to doctors and politicians, swore affidavits, testified before the Canadian parliament and pleaded with Rene Caisse to supply them with more Essiac when they needed it. Some husbands and wives of patients who died wrote Rene letters thanking her profoundly for making life easier - free of pain - and longer for their loved ones. All through Canada and in parts of the United States to day, there are people of all ages who are absolutely convinced that Essiac saved their lives or the lives of friends and loved ones. But you can't buy it in any supermarket. Essiac's powers as a pain reliever for cancer patients are nothing short of phenomenal. In sixty years of personal accounts, the easing of agony and an increased sense of well being - often to the point of getting through the day without narcotics - is one of the predominant themes. In Rene's experience, Essiac proved itself as nontoxic, and without harmful side effects. Compared to that, almost all investigational cancer drugs are highly toxic. Over The last decade, more than 150 experimental drugs have been given to tens of thousands of cancer patients under the sponsorship of the US Federal Government's National Cancer Institute. Many of these drugs have come from a list of highly toxic industrial chemicals, including pesticides, herbicides and dyes. While all anticancer drugs can cause side effects among some of those who take them, the experimental drugs - along with leading to hundreds of deaths - have elicited a nightmarish list of serious adverse reactions, including kidney failure, liver failure, heart failure, respiratory distress, destruction of bone marrow so the body can no longer make blood, brain damage, paralysis, seizure, coma, and visual hallucinations. In Renes' opinion,Chemotherapy should be a criminal offense,she told one reporter. Rene Caisse's files are filled with letters from people all over North America testifying to lifesaving experiences with Essiac. She didn't charge a fee for her services. She accepted only voluntary contributions in the form of fruits, vegetables or eggs, as often as not - from those who could afford to offer them, and she didn't turn away people who couldn't make any payment at all. Rene Caisse lived her whole life in modest circumstances while rejecting offers of vast sums of money to reveal her formula. She refused to reveal her formula to people who wanted to help her; she refused to reveal her formula to powerful institutions that demanded it before they would consider legitimating Essiac. What Rene Caisse wanted was to heal the ill and guarantee the legalization of Essiac for all, yet her intransigent refusal to budge from secrecy about the formula cost her - and us - dearly. Rene's deep fears that played an important role in her refusal to release the formula until after the governing bodies of medicine and law would admit that it had merit: Namely, that once the herbs are publicly identified, these inexpensive and widely available plants will be placed on the federal "controlled substances" roster - like some dangerous drug - suddenly become very difficult - and illegal - to acquire. It seemed that Rene took her formula to her grave. Authorities burned all her found records in steel drums. Years latter, it was discovered that Rene left a copy of her formula and other records with a trusted woman: Eventually she admitted to me that Rene had left her a copy of the formula. As gently as possible I began trying to persuade her to trust me with it. Rene had freely given it to this woman, who had guarded it with complete inflexibility for years. Dr. Gary Glum got involved with a formula based on Caisses recipe. We call it Ojibwa (The Original Ojibwa tea formula). 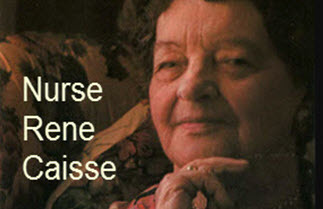 Rene Caisse was a sweet woman who gave her best and saw the worst. She was surrounded most of her life with the pain and suffering of others. She lived under siege much of the time, with a legion of supporters who saw her as a saint and powerful enemies who wanted her arrested for practicing medicine without a license. She became so fearful and paranoid about arrest that she sometimes had to turn away dying people who were pleading with her to help them. But more often, she found ways to help the people who came to her, even total strangers who had nothing to offer her. She said once about her situation: "I was always just one jump ahead of a policeman. We were right across the street from the town jail and the keeper used to joke that he was saving a cell for me." The blessing of Essiac brought a curse for Rene Caisse: Her life was never her own. Rene's account is true. The older people in the Bracebridge area still have vivid memories of Nurse Caisse and her clinic, and all the patients coming from far and near. They still talk about friends or neighbors or aunts or uncles or parents who were saved or at least helped and relieved of pain by Nurse Caisse. They speak of her with great fondness and respect-even reverence. We strongly encourage you to read Dr. Glums enlightening book Calling of an Angel, and use the Ojibwa tea to help your body heal itself. Rene Caisse treated people with cancer with an herbal tea she called Essiac. Today the similar formula is called the Ojibwa herbal formula (Ojibwa tea). Dr. Gary Glum records Rene Caisse's life's story in the book Calling of an Angel. Rene Caisse, RN, dedicated her entire life to helping people with cancer. For over 50 years she made her healing tea in her own kitchen. She called it Essiac Caisse reversed. She administered her product in her clinic in Bracebridge, Canada, and a few US clinics.